Gaia (Mother Nature) is the primal Greek goddess said by ancients to have given birth to the sky, sea, mountains, and all of creation. 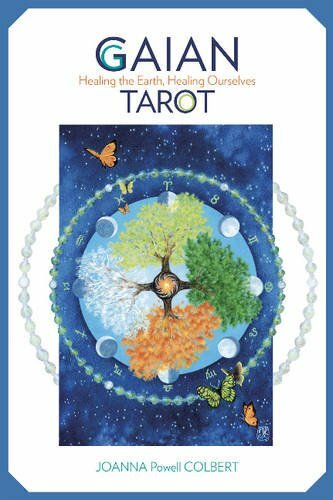 This beautiful 78 contemporary and mythical Tarot set with accompanying spiritual guide have a focus for the healing of the earth and of the self. The Major Arcana cards represent 22 soul lessons and archetypes that grew out of the religious and mystical worldview of Renaissance Europe. The Minors illustrate elements, numbers, and people. Interpretations include uprights and reverse divinatory meanings, themes, exercises, symbolism, journal questions, affirmations, and ten spreads. Sometimes the cards illustrate part of the world we live in, sometimes they show the realms of spirit, and sometimes they inhabit the borderlines between the two. Gaian spirituality understands that humans, plants, animals, stones, and stars are all inextricably linkedawhen one strand is pulled, the entire web is affected. Especially intended for those who practice earth-centered spirituality. Joanna Powell Colbert is an artist, teacher, and convener of circles, named by SageWoman magazine as one of the Wisdom Keepers of the Goddess Spirituality movement. The Gaian Tarot combines her love of symbolic, archetypal art with the mysteries of the natural world.